Copper Roofing - Shingles & Standing Seam Installation Toronto (GTA) - Pro Roofing Inc.
Often, a copper roof will outlast the structure it covers. Copper is a pure, natural material with the added attraction of unique changing visual characteristics. Offering and effectively indefinite design life, it is extremely durable and resistant to corrosion in any atmosphere, requiring no decoration, cleaning and virtually no main	enhance other than the removal of debris that may fall into the gutters. Copper is environmentally friendly, fully recyclable, safe to use and can be worked in all temperatures. Tried and tested, copper is the most trouble-free material for roofing. 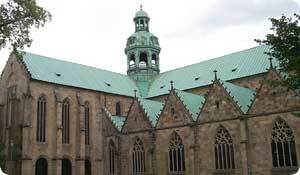 Hildesheim Cathedral roof was installed in 1280 and is intact to this day (over 800 years old!). Call 647 - 521 - 7883 to schedule an estimate or use online form. The Romans used copper as a roof material for the Pantheon in 27 BC and many of the great churches of medieval Europe were roofed with copper. Standing seam roof copper is rated for resistance to the highest winds in Underwriters Laboratories' tests (UL-90). When Copper is exposed to the weather elements, it protects itself by developing a Patina (also called verdigris) over time which reforms if damaged, ensuring durability and resistance to corrosion in virtually any atmosphere. It's the same look that the statue of liberty is sporting, because… you guessed it, the statue is made of copper. There are basically three ways of getting copper onto your roof - as a pre-measured continuous covering - a "standing seam copper roof" or a copper roof formed from smaller copper panels, and as copper shingles. Copper roofing sheet is sold by weight, with the thickness measured in ounces (oz) per square foot; 16 oz cooper sheet is typically used for residential roofing applications, while 20 oz copper sheet is used for commercial applications. Copper sheet for other purposes may be sold by gauge, where the higher the gauge the thinner the material. Pro Roofing guarantees a fast, friendly and efficient service. Our tradesmen have been trained in traditional installation methods, and work to the highest standards to achieve a roof that is as visually appealing as it is watertight. Pro Roofing has done 2 complete roof replacements, and three major patches for my remodeling projects in the last several years. They are always quick, professional, clean and affordable - things I need in the type of work I do with my clients. They are very detailed in their estimating and there are no assumptions and guess work. Everything is laid out on paper, and you know exactly what you're getting. One time additional work appeared, it was added to the contract and delivered as agreed. I don’t even get competing prices anymore because I am confident in them. Recommend them for other professionals/companies and for everyday homeowners.